A perfect combination of ultra low cost with a durable and reliable design. The TSC TDP-244 has plenty of memory with 8MB DRAM and 4 MB FLASH that can be used for easy storage of fonts, international character sets and graphics, and it supports, "right out of the box," a fully compatible set of standard industry emulations, including Eltron and Zebra languages, making it easy to replace old installed hardware. TDP-244 Barcode Label Printer, Printer, Direct thermal, 203 dpi, 4 ips, USB Only, 4MB Flash Memory, 8MB DRAM, 108 MM Print width, Power supply and Power cord. 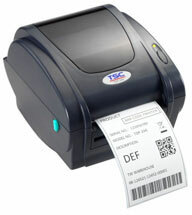 Direct Thermal Printing, 203 dpi, 4 ips, USB interface, Peel-Off kit, 8MB, 4MB Flash.